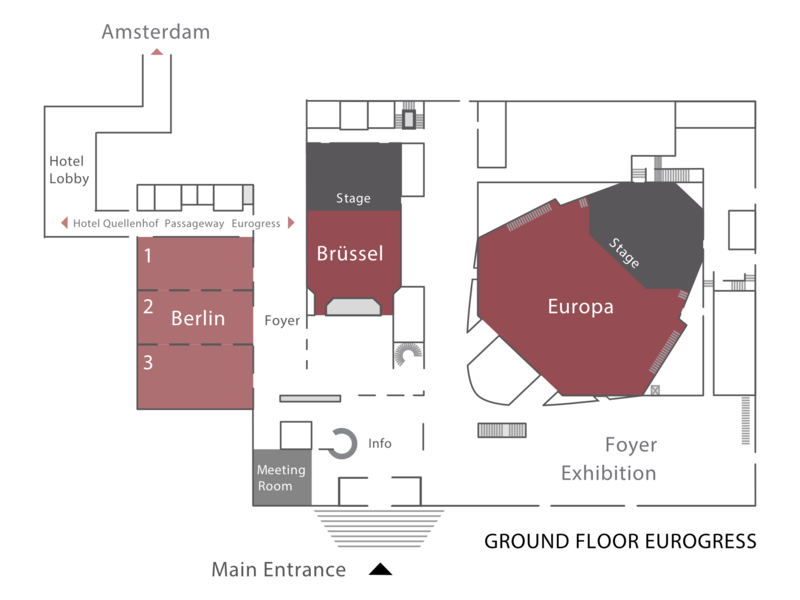 The Eurogress Aachen conference site is an impressive venue where many national and international conferences are held throughout the year. 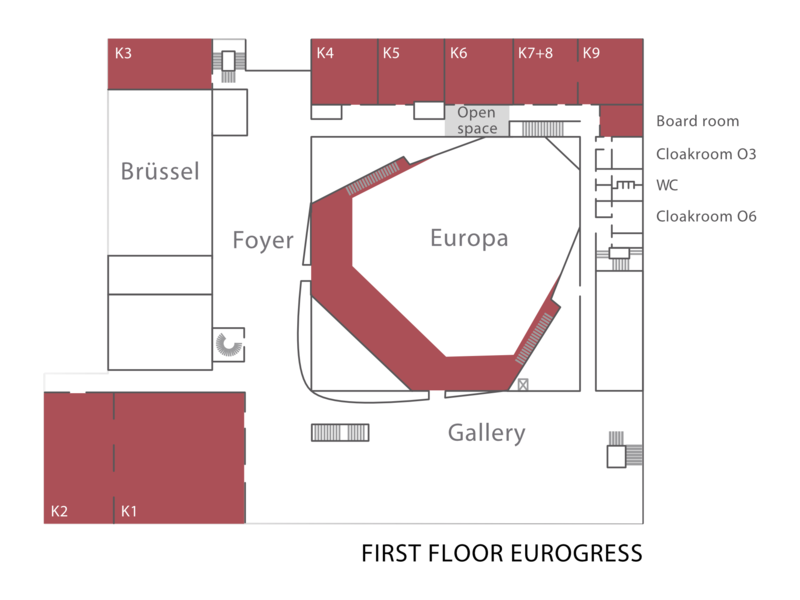 The Eurogress is situated within walking distance from Aachen's old town and pedestrian area. The Emperor’s City is a popular travel destination. This is not just because of its favourable geographical position but also due to its large variety of art and culture, elegant shops and pubs. Aachen is situated in an area where the three countries of Germany, Belgium and the Netherlands meet. You can easily get to the Eifel hills in a short time. You will soon see how much variety the city has to offer. The source of the city’s fame is the Aachen water. It is heated by the Eifel volcanos up to a temperature of 74°C and is known to be the hottest volcanic spring water north of the Alps. The Celts knew about the Aachen water and after them the Roman legionaries also found that the warm water was able to cure various illnesses. Today Aachen’s bathing tradition, which is nearly two thousand years old, has been revitalised by the Carolus Thermen (Carolus Baths) of the Aachen spa. A new – and at the same time ancient – bathing culture comes back to life: “well-being” and “fun”, which means healing relaxation and social interaction come together to form an extraordinary experience. The hot Aachen water remains the fundamental life elixir of the city. Pippin the Short, Charlemagne’s father, had already built a chapel and a royal bath in Aachen near the hot springs. In the second half of the 8th century, Charlemagne, to whom Aachen owes its worldwide fame, invited artists from all parts of Europe to come to his city. He asked them to decorate his residency, the “Kaiserpfalz” (Emperor’s Palace), with great lavishness. At the heart of the Palace complex lies the Aachen Dom (Cathedral). In 1978 this was the first German building to be included in the Unesco list of World Heritage Sites. The Dom is proud to house the most precious treasure north of the Alps. These can be seen in the Cathedral Treasury. Not far from the Cathedral is the Gothic Town Hall. Its facade is richly decorated with countless figures that remind people of the German coronations that took place in Aachen. The Market and small streets were restored with great accuracy and are full of restaurants and pubs. While the beer is flowing in the pubs, a large number of active fountains can be found at all corners of the city. At Schinkel’s classical “Elisenbrunnen” (Elisa Fountain), the Aachen emblem, you can try the healing water with its high sulphur content. However due to the strong smell, some curious visitors can’t quite find the courage to give it a go. A sweet Christmas present has spread Aachen’s fame across the globe: The “Printen” are made from a kind of dark and spicy ginger bread and can be bought in the Aachen Christmas Market as well as in many other places in the city.